Enter the world of Drawn! 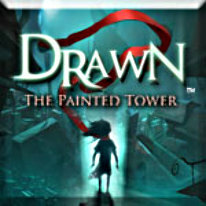 Unravel the secrets of the Painted Tower while overcoming challenging puzzles on your quest to save Iris. A curse has locked each floor of the tower, and only the most creative adventurer can find a way through. Enter lush painted worlds and meet fantastic characters who will help you…and sometimes try to stop you, on your quest through the dream world of The Painted Tower. Beware! Darkness approaches the tower. Can you save Iris in time?